Representative Honours: Northern Ireland: 1 Full Cap / 1 Goal (1980); Irish League: 3 Caps / 3 Goals (1980); Irish FA Representative. Club Honours: (with Linfield) Irish league Champion 1979/80; Irish Cup Winner 1979/80; Tyler All-Ireland Cup Winner 1980/81; Gold Cup Winner 1979/80; Ulster Cup Winner 1979/80; Co. Antrim Shield Winner 1980/81. * all domestic games, both spells. Colin McCurdy grew up on the Donegall Road, just half a mile from Windsor Park, and his prolific career saw him spend two spells with Linfield. Following spells with Cliftonville (on loan) and Larne, he got his chance in England with Fulham where George Best was winding down his career. McCurdy's only match for the Cottagers came against Southampton at the Dell in November 1977. After a nasty ankle ligament injury ruled him out for eight months, McCurdy failed to make any further impact at Craven Cottage, and spent the summer of 1978 playing in the NASL with Philadelphia Fury. 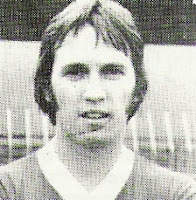 McCurdy initially left Linfield under something of a cloud, having been left out of the 1976 Irish Cup final despite playing in all the earlier rounds. His second spell at Windsor Park proved much more successful. 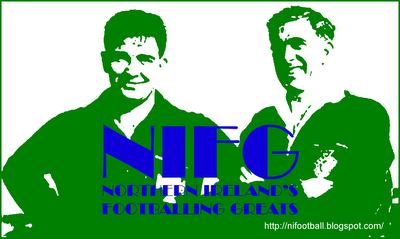 He represented the Irish League on three occasions during 1980, scoring on each of his appearances. He claimed all the major honours aside from the Co. Antrim Shield, and scored in both the Irish Cup and Gold Cup finals. That same year he was selected by Billy Bingham for Northern Ireland’s tour of Australia. He made his sole full international appearance in the penultimate game of the tour, coming of the bench to win a penalty, which was converted by Noel Brotherston, then score the winner. The 1980/81 season brought McCurdy winner's medals in the Co. Antrim Shield and in the Tyler Cup with his goal key in the second leg away to Athlone. At the close of that season Linfield manger Roy Coyle decided McCurdy was surplus to requirements. He became Crusaders record ever signing, becoming a regular in defence at Seaview. He played his final Irish League game for Bangor against Linfield in 1990. McCurdy, now a multi-accredited coach, was appointed reserve team manger at Bangor in November 1988 and acted as assistant manager of the Seasiders and Glenavon under Nigel Best and coached with the IFA. In 2000 he emigrated to Canada to become Technical Director of the Eastern Ontario District Soccer Association, before being appointed to the same post at Ontario Fury in 2004. In February 2009 he succeeded Marty Quinn as manager of Bangor, initially on a caretaker basis, but resigned in September 2010 due to disappointing results. Summary: 0(1)/1. Won 1, Drew 0, Lost 0. Summary: 3/3. Won 1, Drew 0, Lost 2.